The Office of the Attorney General is directed under RCW 36.70A.370 to advise state agencies and local governments on an orderly, consistent process that better enables government to evaluate proposed regulatory or administrative actions to assure that these actions do not result in unconstitutional takings of private property. 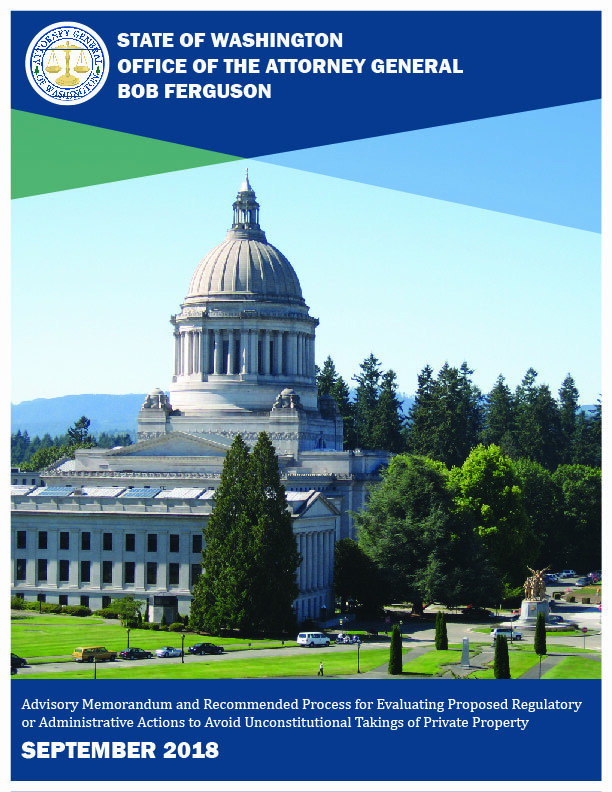 This process must be used by state agencies and local governments that plan under RCW 36.70A – Washington’s Growth Management Act. The recommended process may also be used for other state and local land use planning activities. Ultimately, the statutory objective is that state agencies and local governments carefully consider the potential for land use activity to “take” private property, with a view toward avoiding that outcome. This Advisory Memorandum was developed to provide state agencies and local governments with a tool to assist them in the process of evaluating whether proposed regulatory or administrative actions may result in an unconstitutional taking of private property or raise substantive due process concerns. The failure to fully consider these constitutional limits may result in regulatory activity that has the effect of appropriating private property even though that outcome may not have been intended. If a court concludes that private property has been “taken” by regulatory activity, it will order the payment of just compensation equal to the fair market value of the property that has been taken, together with costs and attorney fees. In other cases, a government regulation may be invalidated if it is found to violate constitutional substantive due process rights. This Advisory Memorandum is intended as an internal management tool for agency decision makers. It is not a formal Attorney General’s Opinion under RCW 43.10.030(7) and should not be construed as an opinion by the Attorney General on whether a specific action constitutes an unconstitutional taking or a violation of substantive due process. Legal counsel should be consulted for advice on whether any particular action may result in an unconstitutional taking of property requiring the payment of just compensation or may result in a due process violation requiring invalidation of the government action. The Office of the Attorney General reviews the Memorandum on Takings on an annual basis and updates it when necessary to maintain consistency with changes in case law.